I was mistaken when in my last chapter I wrote that the postal statement for All For Love listed Joe Genalo as the editor. That was true for all such statements except the first which listed Joe Simon and Jack Kirby as the editors. Where Simon and Kirby really the editors or was this just an error caused by cutting and pasting from a statement in Young Romance to the one for All For Love? I believe it was just an error because in this chapter as in the last one, different artists appeared in the different publications. 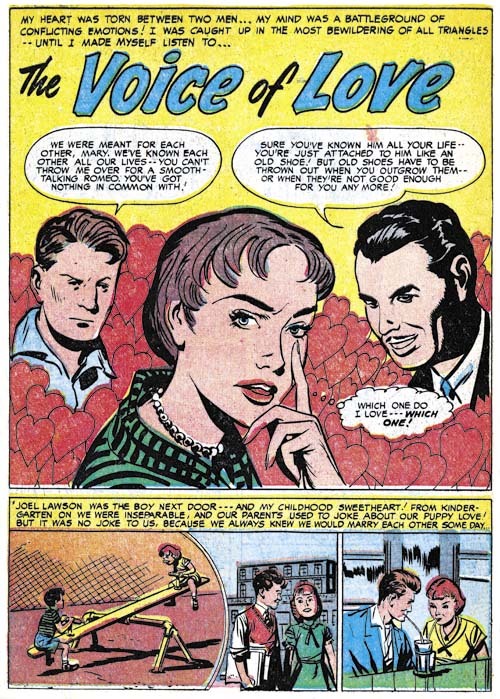 Jack Kirby and Bill Benulis only appeared in Young Romance while Ted Galindo only appeared in All For Love and Personal Love. 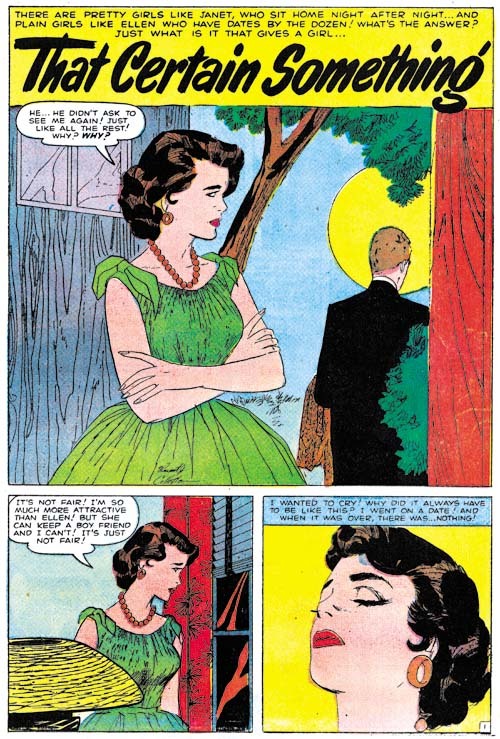 Marvin Stein appeared to be the only artist appearing in both Young Romance and All For Love, although oddly not in Personal Love. 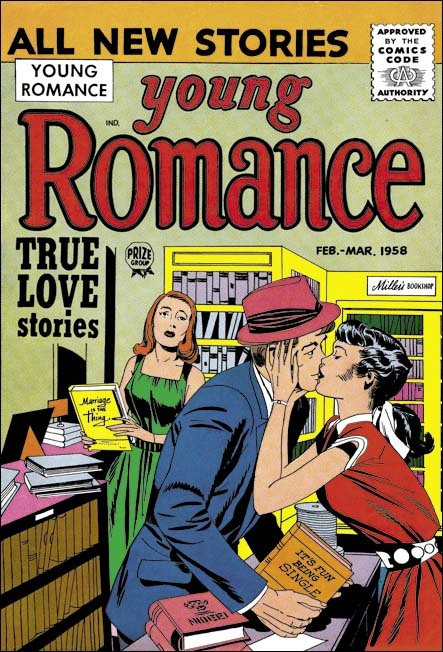 The cover for Young Romance #92 (February 1958) was the first one that Kirby did since his run of all-Kirby Prize romance issues of 1956. The preceding six covers done by other artists is a clear indication of the very different nature of Young Romance from 1957 on. Previously Kirby was the artist for all drawn covers except during the period when he and Joe were busy with Mainline Comics (there own publishing venture). This cover was inked by Kirby as well in the manner I call the Austere style (Jack Kirby’s Austere Inking). Older techniques like picket fence crosshatching (Inking Glossary) are absent although drop strings continue to be used but in an overlapping manner. Inking is sparser giving the art a lighter look. When a black region is called for it is executed by flooding the area with ink. The Austere style appears to have been adopted as a means to speed the inking process but not by sacrificing the aesthetics of the final result. “Running Mates” marks the beginning of Kirby inking his stories as well. An inker working on his own pencils always has an advantage, but when the artists is as talented inker as Jack was the difference can be astonishing. Jack’s drawing style has changed as well compared to his earlier work. His lines take on a more abstract quality. Look at the woman in the splash; particularly here nose and eyelids. This is far from realism but provides the figure with an expressive quality that realistic art generally fails to achieve. Kirby would not inked all his pencils during the period covered by this chapter, or even most. There are a number of Kirby stories that seemed to be inked by the same artist but I am generally not willing to commit myself to say who that artist was. However I have little doubt when it comes to the inker of “Jealousy”. Marvin Stein inks this piece in exactly the same manner that he would ink his own. When looking at the details it is easy to forget about Kirby’s involvement because Stein’s touch so permeates the piece. Only when one steps back to look at the forest instead of the trees does Jack’s hand become obvious. It is in my opinion a beautiful combination. This is one of my favorite Kirby pieces inked by someone other than Jack himself. None of the stories from this period that I attribute to Bill Benulis are signed but the style does look like his. 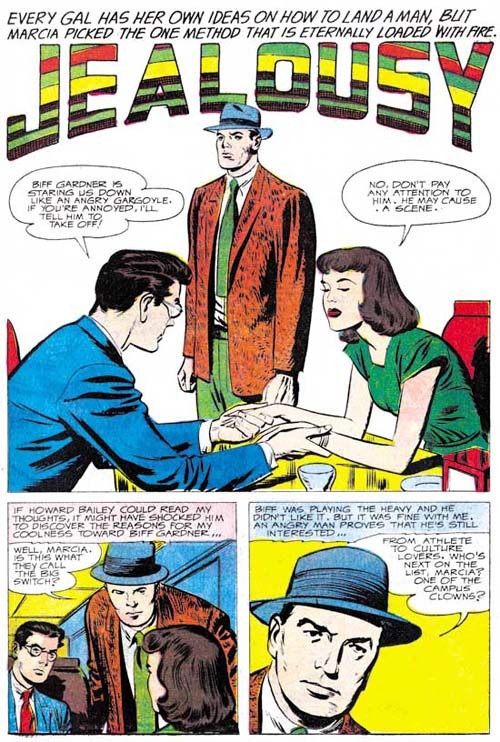 Benulis did some signed work for Simon and Kirby published in January 1954 (Young Brides #11 and Young Love #53) but I also credit to him an unsigned work from October 1955 (Young Love #67). Benulis is one of the younger artists who did romance in a more modern style and gave his characters more modern clothing and hair styles. Bill had a penchant for patterned clothing as for examples seen worn by the woman in the splash page above. 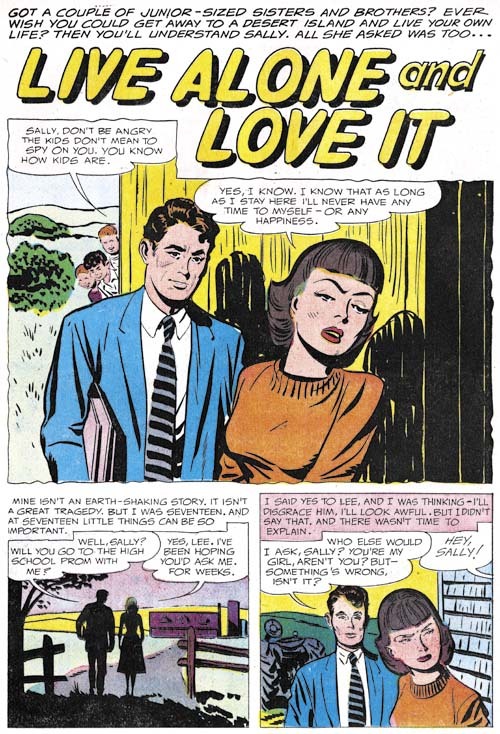 8/8/10 – Based on observations made by some commentors I went back and compared this and three other stories with “Live Alone And Love It” from Young Romance #91 (December 1957) a piece signed by Vince Colletta. All appeared to be inked by the same artist, Vince Colletta. I also compared these four stories with work from 1954 and 1955 that can confidently be credited to Bill Benulis. I no longer feel they all were done by the same penciller. I still feel that “Loveable Dud” and the other three stories were pencilled by a different artist than the Colletta signed piece. Therefore I have removed the Benulis attribution and left the penciller as unknown while crediting the inking for all to Vince Colletta. All For Love #6 (February 1958), pencils by Joe Orlando? The cover for All For Love #6 is unsigned but appears to be by the same artist who initials J. O. appear on other All For Love, Personal Love and Justice Traps the Guilty covers. There have been some comments (both supportive and not) to the last chapter about my tentative suggestion that these covers may have been done by Joe Orlando. Frankly I have not real evidence to back up my suggestion. The artist is quite talented and he almost certainly has done work in comic books before. There really are not a lot of candidates from this period with these particular initials. None of the candidates seems more appropriate than Joe Orlando and so I am now questionably attributing this material to him. My practice in this blog is to use provide credit based on my own observations but this in no way should be interpreted as a disagreement with those who are more knowledgeable about certain artists than I am. Once I have had a chance to familiarize myself with the work Orlando did for other publishers, I am sure either the question mark will be removed or the attribution dropped. Ted Galindo was perhaps the most used artist for All For Love and Personal Love during this period. He certainly is one of my favorites. The above page is a good example of why I like him. The floating hearts are, in my opinion, a little hokey (but very much in fashion for the period) but otherwise this is a well designed and executed sequence. 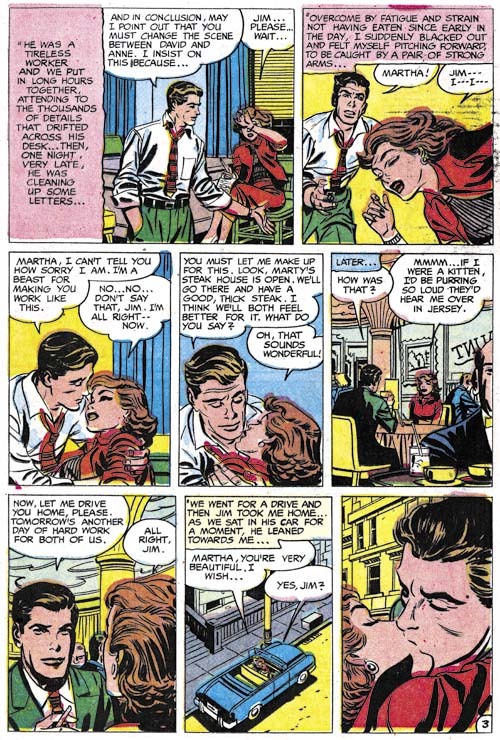 As in the last chapter, Marvin Stein appears in Young Romance (produced by Simon and Kirby) and All For Love. In some ways this is the better romance work compared to what Stein had been doing earlier in his career. In general I feel that Marvin’s style was more appropriate for the crime and western features he was doing for Prize. But now his woman are more lively and attractive. But I do feel Stein’s art now looks a bit rushed. This serial post has now entered the period after the crash and near collapse of the comic book industry. Prize Comics was never a big publisher but these must have been particularly difficult times. At the start of this period Prize was only publishing three bi-monthly titles Justice Traps the Guilty, Young Romance and the new released All For Love. In September they would also release another new romance title, Personal Love. Like All For Love, Personal Love was not produced by Simon and Kirby. The annual postal statements list Joe Genalo as the editor and the contents seem somewhat different from that found in Young Romance. The artists used also seemed to be different as well, at least during this period. 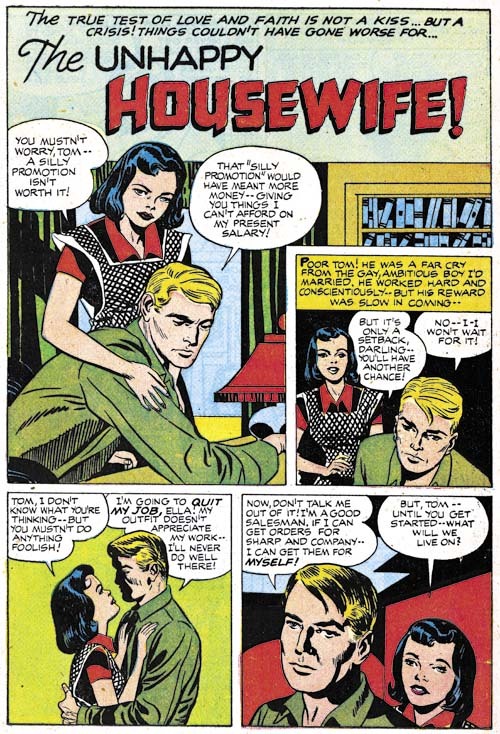 Jack Kirby appeared in three of the four issues of Young Romance covered by this post but did no work for All For Love or Personal Love. Lou Cameron played an important part in Young Romance #89 and #90 but he does not appear in the other Prize romance titles. On the other hand Ted Galindo appears frequently in All For Love and Personal Love but he does not show up in these issue of Young Romance. Since at this time Kirby was freelancing for DC and Atlas, it is clear that he and Joe were no longer running their old studio. So the question becomes how Young Romance was actually produced. While previously there can be found examples of Jack in his roll as an art editor stepping in to fix up some parts of stories supplied by other artists or provide a splash page, I have seen no examples of that practice in the period from 1957 to 1960. On the other hand the annual postal statements still listed both Simon and Kirby as editors up to 1960. My suspicion is that Jack really was not involved in the editorial work for Young Romance and it was Joe who was really producing the title. Not that I believe this effort took much of Joe’s time; it was only a single bi-monthly title. 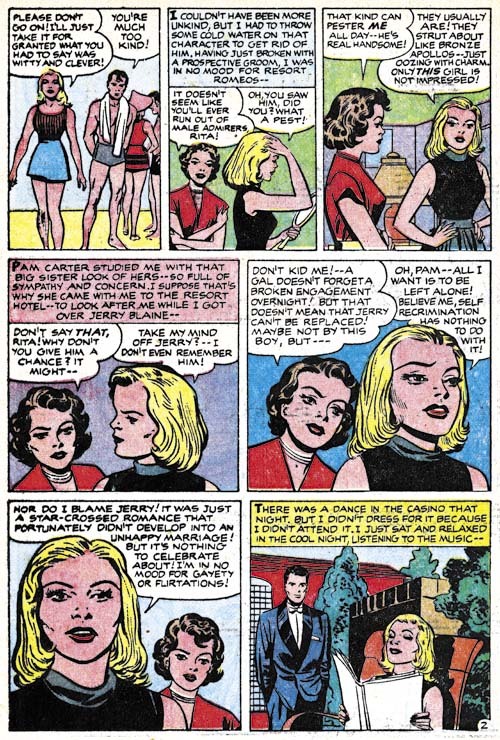 Jack Kirby provided art for three of the four issues of Young Romance during this period. However all were rather short pieces (1, 4 and 5 pages) and only one of them was the lead feature (a position often reserved for Jack in the past). All were nicely done but hardly very remarkable (for Kirby). Jack did not inked any of the pieces but one of them “The Waiting Game” looks very much like it was inked by Marvin Stein. Not the blunt but still subtle handling of the face of the man in the background of the splash. Of particular significance is the handling of the lady in the first story panel. She share a rather distorted perspective that I find hard to describe but is so often seen in Stein’s own work when a head is viewed from above and to the side. I am not as confident that Stein inked the other two Kirby stories but he could have. 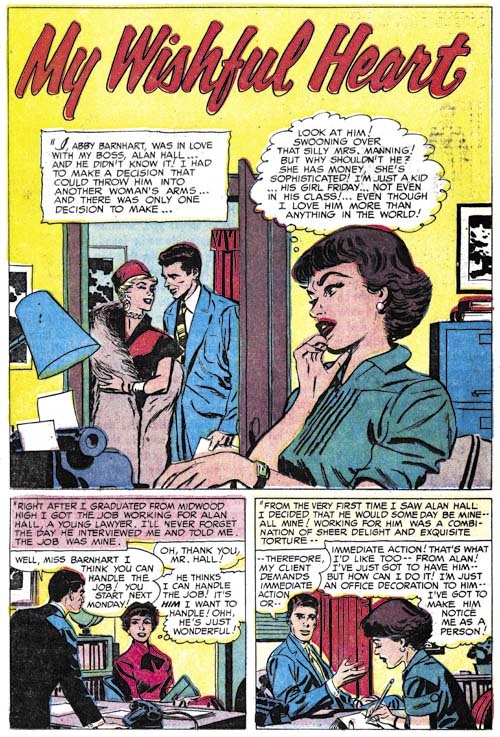 Marvin Stein not only inked a work for Jack Kirby but he penciled and inked his own story for Young Romance. I have remarked before how I find Stein’s style more appropriate for the crime genre than it was for romance. His “Live Alone and Love It” seems done in a particularly blunt manner even for Stein. 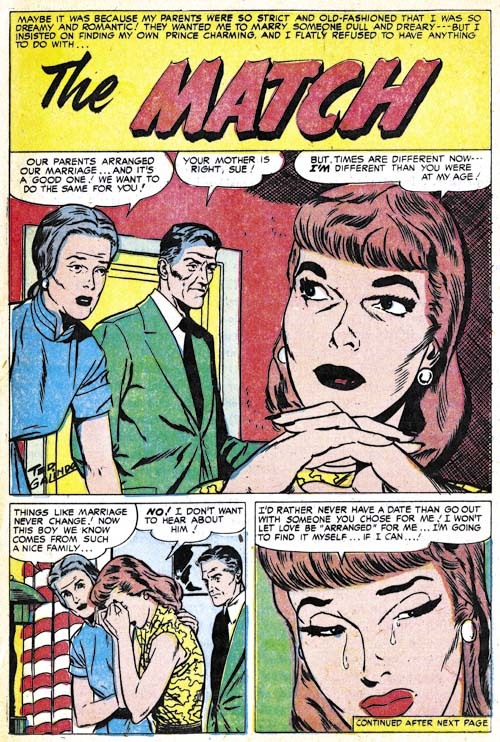 Note the simplified eyebrows of the lady on this page, very reminiscent of the inking found in some of the Kirby pieces, another reason to possibly attribute to Marvin some of the more recent inking of Kirby’s art. Stein was an exception in that he appeared not only in Young Romance but also All For Love and Personal Love as well. However prior to this he also was one of the very few artists that worked on both Simon and Kirby productions along with the titles not produced by that pair. 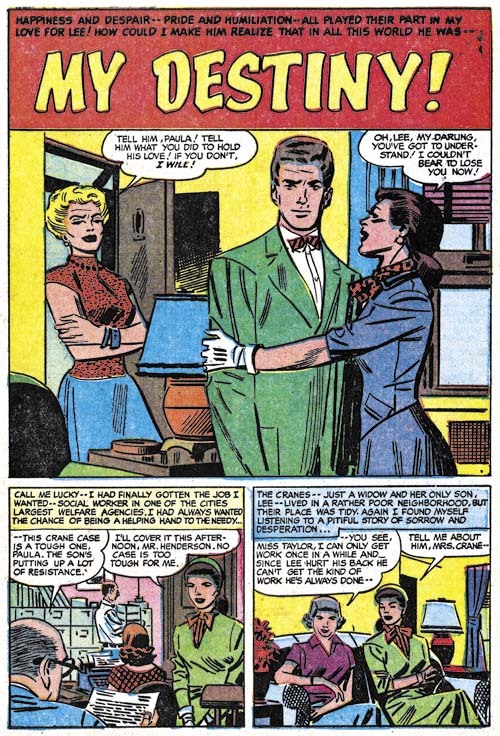 Lou Cameron, an artist new for Young Romance, played an important part in issues #89 and #90 supplying 5 stories. His work was really excellent; great graphic story telling and beautifully drawn women. Like some of the other younger artists new to the title, Lou drew in what I would describe as a more modern style. I am not that familiar with Cameron’s art but he also work for Atlas, DC and St. John Publishing. I am not sure what to attribute his sudden abundant appearance and just as quick disappearance in Young Romance but he is one of the artists that I wish had made a longer contribution to the title. 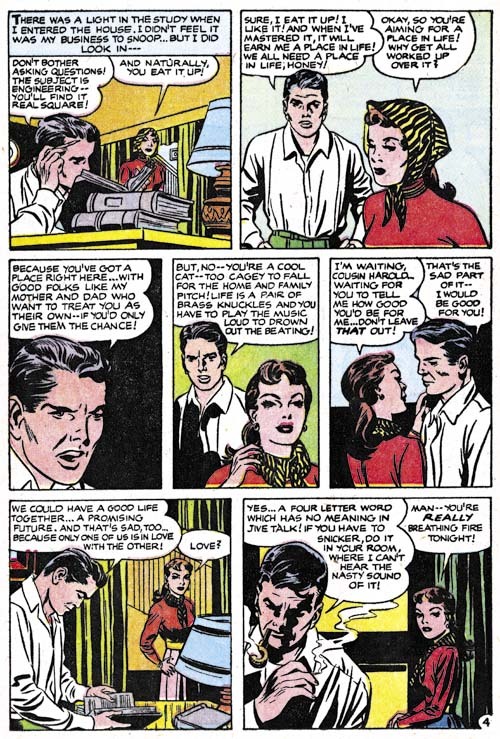 Young Romance #91 included the only appearance of Vince Colletta in a Simon and Kirby production. Colletta did a lot of work for Atlas, much of it romance art. However he is most famous as the inker that Kirby fans love to hate. Mostly this is due to his habit of erasing some of Kirby’s pencils to speed up the inking. Oddly Colletta has a small but very vocal group of supporters who I refer to as Colletta apologists. According to the Colletta apologists, Vince was the greatest romance artist who worked in a realistic style. While I admire Colletta’s romance art, neither of these assertions are true. I have never heard anyone other than a Colletta apologists claim Vince as their favorite romance artist and as far as I can tell Colletta apologists otherwise have no interest in romance art. And while his woman are beautiful they are not truly realistic. This is fortunate because I do not believe true realism would be appropriate for comic books. For my part, while I find Colletta’s women beautiful, I also find them to lack any individuality. The only distinction found between individual examples are the hair styles and clothes. Still he is another of those artists that I wish provided more work for Young Romance. In these last few chapters of the Art of Romance, I do not plan to discuss all the artists that appear in the Prize titles. Frankly most of them are not that great and I am so far unable to identify them. That is not to say that they are totally uninteresting. This is a period of transition for Young Romance as the title tries to maintain its appeal with a more modern audience. Hence the inclusion of rock-and-roll in some of the stories. However there is a tendency for rock music to be judged somewhat negatively. 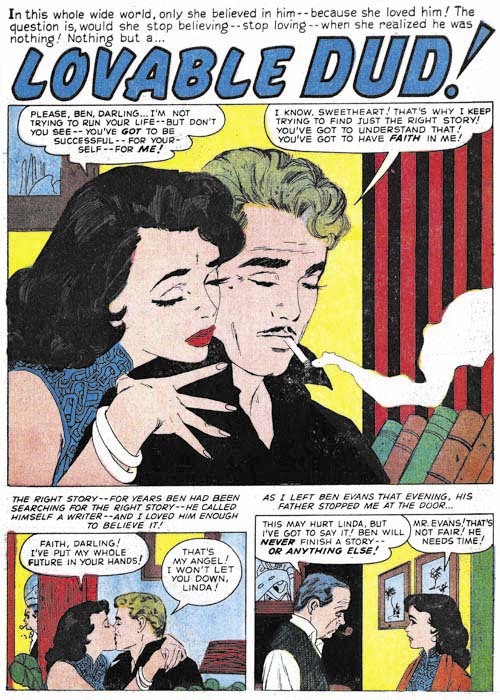 Mort Meskin provides two stories for All For Love #2 (June 1957). Both works appear to have been inked by Mort as well. As far as the art is concerned the work is nicely done but does not differ much, if at all, from the romance work that Mort did up until the end of 1955. It is not the art that is a cause for a surprise but his appearance in a Prize comic. As I wrote, his romance work was about a year and a half prior to this but his art appeared in the Prize crime titles for a few months further (March 1956). 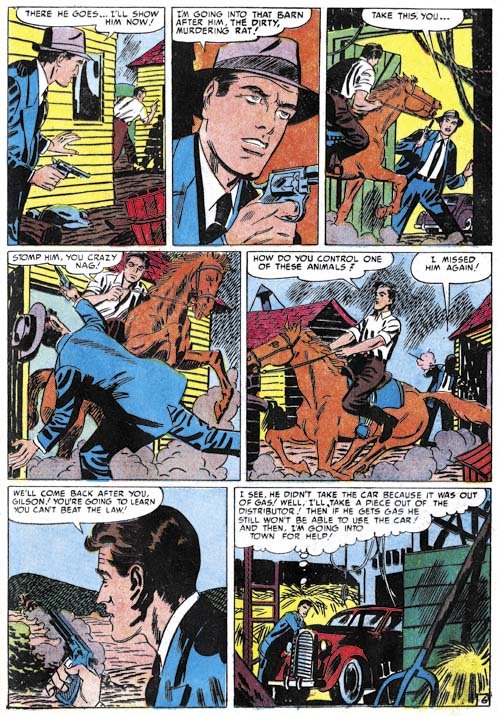 His last work for Prize Comics Western was for the July 1956 issue. Then suddenly these two stories in All For Love and then Meskin disappears from further Prize comics. I suspect that Prize offered much lower page rates than what DC did which is where Meskin was doing most of his work at this time. 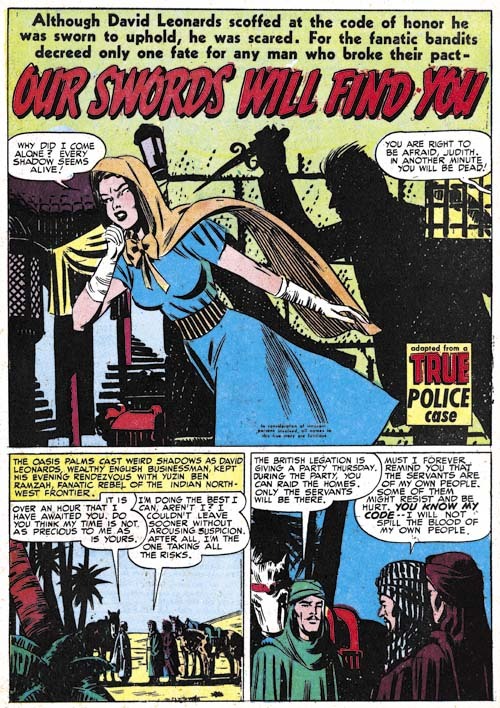 But it is suggestive that it was in All For Love that Meskin appeared and not Young Romance which was still being produced by Simon and Kirby. 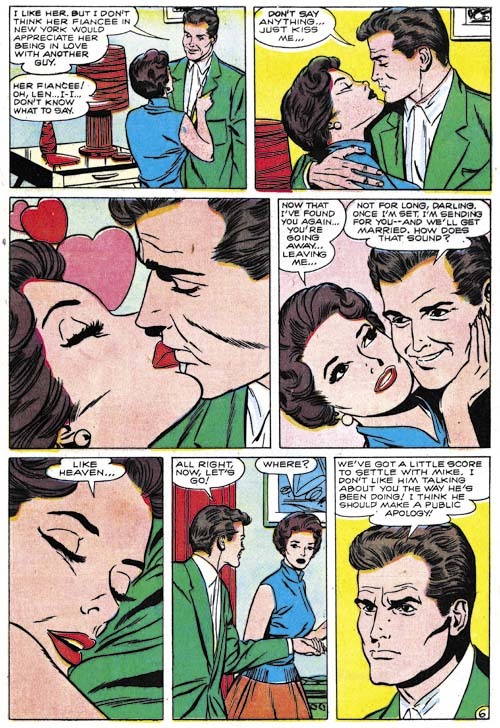 In any case I believe this was the last romance comic book art that Mort Meskin would ever create. 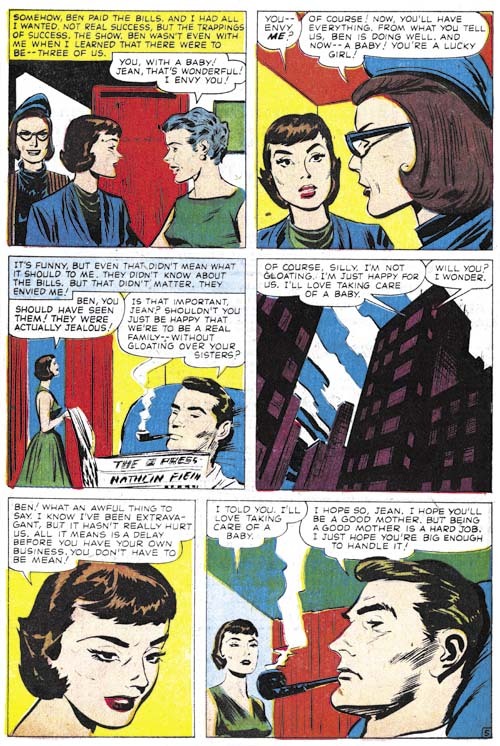 As mentioned above, Marvin Stein was one of the few artists appearing in Young Romance as well as All For Love or Personal Love. If anything, the art for “The Voice of Love” shown above is more carefully drawn than that from Young Romance #91. Ted Galindo provided work for all the Prize titles at this time except for Young Romance. Ted had previously drawn a story for Foxhole which, to be frank, was really not that well done. His romance work was much better, most likely because he now was a more experienced comic book artist. I feel the best work he was doing at this time appeared in Justice Traps the Guilty which will be the subject of a future chapter to Criminal Artists. 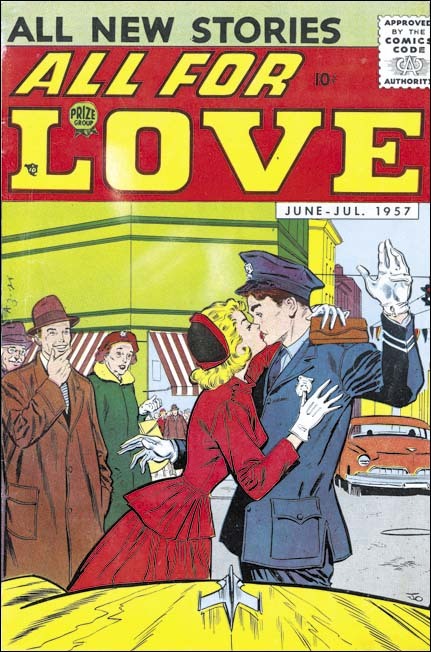 All For Love #2 (June 1957), art by J.O. Some of the Prize titles during this period had cover art signed only as JO. No interior stories bear that signature and as far as I can seen none of the unsigned pieces were by this artist. The covers are very well done and indicate that this is a talented artist. I have only begun investigating whom this might be and have not reached any but the most tenuous conclusions. Although I have as yet no good evidence to back it up, I wonder if this might be by Joe Orlando. I could not resist including another romance story from this period with a rock-n-roll reference. In the background of the splash can be seen a singer playing an acoustic guitar. That, plus the lyrics he sings, clearly were meant to be a reference to Elvis Presley who was very popular at that time (and since). You can see the complete list in Newsarama. As was the case with the Eisner nomination, the BoSK faces strong competition. “The Rocketeer” is just an amazing book. I am currently reading the second volume of IDW’s “Rip Kirby”. Although Alex Raymond is usually remembered for his Flash Gordon, I believe his Rip Kirby was much better and more important. Some of the other books I have not had the chance to examine closely but who could question the importance of Harvey Kurtzman? “Alter Ego” is the magazine to go for anyone interested in the silver and golden age comic book artists. So once again I am not holding to much hope of “The Best of Simon and Kirby” actually winning one of these awards. However I am quite pleased to have been part of a project that is has received the recognition that these nominations bring. Joe Simon has a very rare book. It is the only copy of the “Simon and Kirby Superheroes” in the Western Hemisphere. So it was my great pleasure to have a chance to leisurely examine it during my visit with Joe today. My impression can be summed up in one word. Okay, perhaps I should expand a little on that. Beautiful printing, beautiful colors, beautiful layouts, beautiful binding, beautiful cover… it is just beautiful. If you have seen the “Best of Simon and Kirby” you know what to expect in terms of paper, printing and colors. The book uses the same high quality flat paper stock. The printing is good and clean with nice bright colors and rich blacks. In my completely biased opinion the restoration is even better than that for BoSK. BoSK is still special because of its size (and of course the wide range of genre) but “Simon and Kirby Superheroes” is no small book in either page count (480 pages) or size. I have heard a lot of complaints about the reduced size of some recent reprints but that is not a problem here. All the art is reproduced in its original dimensions. And it makes a world of difference. This is the book I could only dream of ten years ago. This is the book all Simon and Kirby fans will want to have. More importantly this is the book that people who have not previously considered themselves Simon and Kirby fans will want. Wait until you see this book. Fortunately Joe’s volume will not be rare for very long. Those lucky enough to go to San Diego will have a chance to buy a copy. Joe Simon will not be traveling out west to the convention but the books sold there will come with a bookplate signed by Joe with a surprise accompanying autograph. Regrettably the rest of us who cannot go will have to wait for October 12. (Okay I am hoping to get my copy before that). This is the second of my post of the various artists who worked in the Prize crime titles Headline and Justice Traps the Guilty after they were no longer produced by Simon and Kirby. In the previous chapter I wrote about Marvin Stein who was the dominant artist for these crime titles. Now I will review the crime art by Mort Meskin, the second most used artist. Meskin provide art from 1950 to 1955 and while he does not appear in every issue from that timeline he does appear in most. Mort is one of the forgotten masters of the comic book art form. Hopefully Steven Brower’s upcoming book, “From Shadow to Light: The Life and Art of Mort Meskin”, may help to correct this undeserved neglect. There are a number of reasons to explain Meskin’s neglect by today’s fans. Perhaps the most pressing is the current emphasis on superheroes. Meskin did some great superhero work but it was older work on heroes that no longer play much of a part in modern comics; the Vigilante and Johnny Quick. The original comics are very expensive and little of Meskin’s war time work have been reprinted. Most of today’s fans have never had much of a chance to see Mort’s superhero work. The only superhero work that Meskin penciled for Simon and Kirby was on Captain 3-D and that was never published (Captain 3-D #2 ). Most of Meskin’s art done in the 50’s was for romance. The romance genre is probably the most underrated one for today’s fans. This unfortunate because Mort really showed his skills as a graphic story teller. Those skills, however, were still evident in his work for the Prize crime titles with the additional benefit or more action and drama. Mort Meskin had initially provided work for the Prize crime titles in 1948 but that was in collaboration with Jerry Robinson. 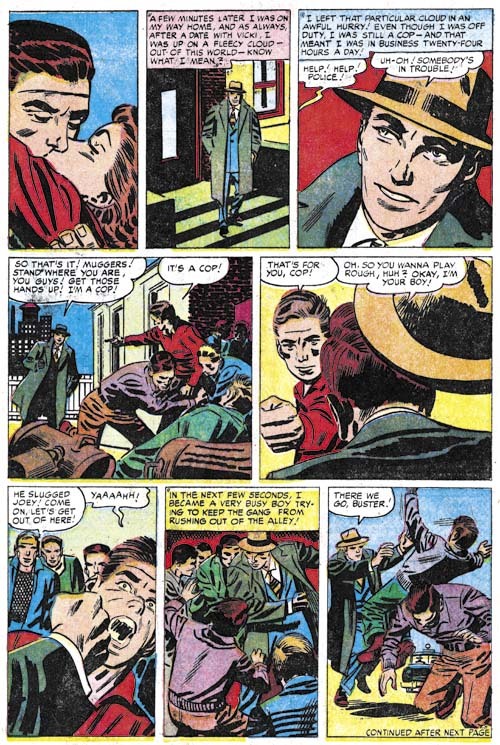 Meskin returned to the Simon and Kirby studio by himself in 1950 at which time Simon and Kirby were still producing the crime titles. 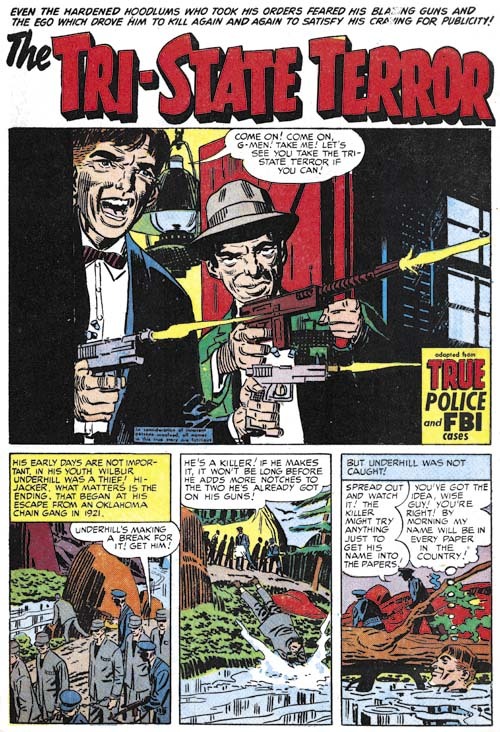 By this time Simon and Kirby had toned down the violence in the crime titles to a level that would continue even after they stopped producing the titles. Even though the stories lacked the violence found in crime comics by other publishers, they still are enjoyable to read. It appears that Meskin did most of the inking of his own pencils for the Prize crime comics (I think this is true for the romance titles as well). In the earlier issues Mort’s inks give the art an overall dark look. Not surprisingly this works out particularly well for night scenes such as in the splash for “Our Swords Will Find You”. Years before the first stalker movies, Meskin provides all the essential elements. A beautiful girl alone in the night pursued by a mysterious knife holding figure which in this case is scene only through the shadow he casts on the wall. 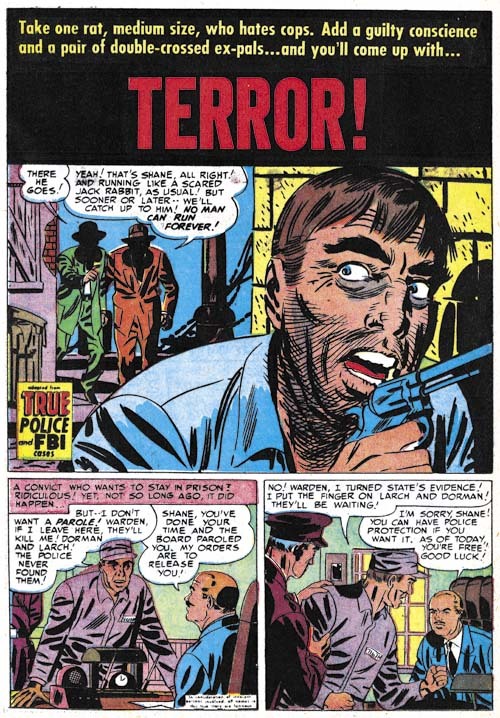 Another example of the darker inking initially used by Meskin for his crime stories. Even though the clothing folds are thick and dark, it can still be seen that they were constructed from long sweeping but narrow brush strokes. This is typical of Meskin inking. However it should be used with caution for inking attribution because unlike Jack Kirby, Mort would include spotting in his pencils. In this case it is accompanied by some other typical Meskin inking techniques. For instance note the way that the shadow on the man’s shoulder has a distinct border strip and is not completed filled with ink but rather formed by thick black strokes separated with narrow spaces. Here Meskin uses a vertical splash; a format that he seemed particularly fond of. Still most of the time Mort uses a horizontal 2/3 page splash like most of the artists did in Headline and Justice Traps the Guilty. 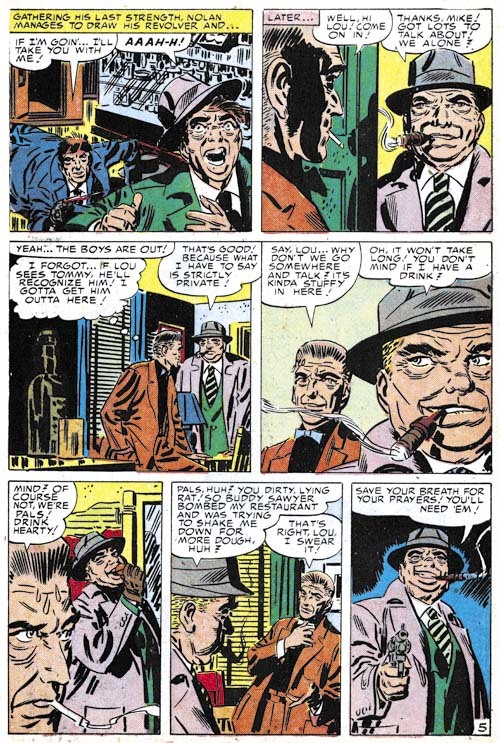 Full page splashes did not appear in the Prize crime comics after Simon and Kirby stopped producing them. “The Tri-State Terror” is perhaps one of Meskin’s finest splashes from the crime titles. The G-Men are not shown but hopefully are sheltered from the blistering attach by the two criminals. The near distance view highlights the defiance of the one hood and the casual determination of the other. These two seem determined not to be taken. Our focus is concentrated by the careful use of blacks. Close-ups did not play as important part of Mort Meskin’s art as they did for artists such as Marvin Stein. Still he did make effective use of this device from time to time. This splash is a good example. This close-up of a fleeing man may seem more stylized than some other artists but it still is a gripping portrait of a man filled with fear. Hiding the faces of his pursuers in shadow makes them mysterious and heightens the effect. The page I selected from “Fatal Mistake” provides another example of Meskin’s use of a close-up. I particularly like the sequence for the top row of panels. Mort goes from a more distant shot, to just the upper body, and then finally just the face while simultaneously rotating the view point. This all plays into the story line that starts with a declaration of reluctance by the loan officer, to a admittedly unfavorable offer and finally to blatant arm twisting. Thus both the art and the writing are increasingly revealing the character of the loan officer. Crime stories are very different from ones about superheroes but at least they provide more opportunities for the use of action than the romance genre. Mort does not do the sort of choreography (for lack of a appropriate term) that Marvin Stein used but he does make careful use a shifting viewpoints. 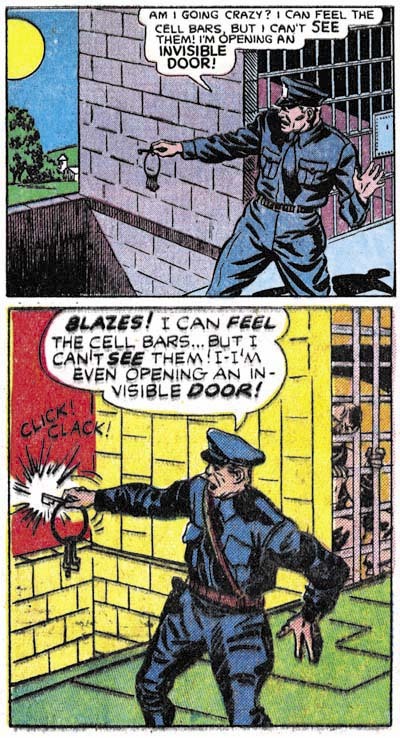 Note how the pursuer appears in the foreground in the first panel, switches to the criminal in the third, only to have the rolls repeated switch in the fourth, fifth and sixth panels. The distance between the two varies as the sequence proceeds as well; starting with a greater separation, working up the close confrontation in panel four then the separation between the two increases again until panel six. Another action sequence starting with a panel that would have been right at home in Young Romance. 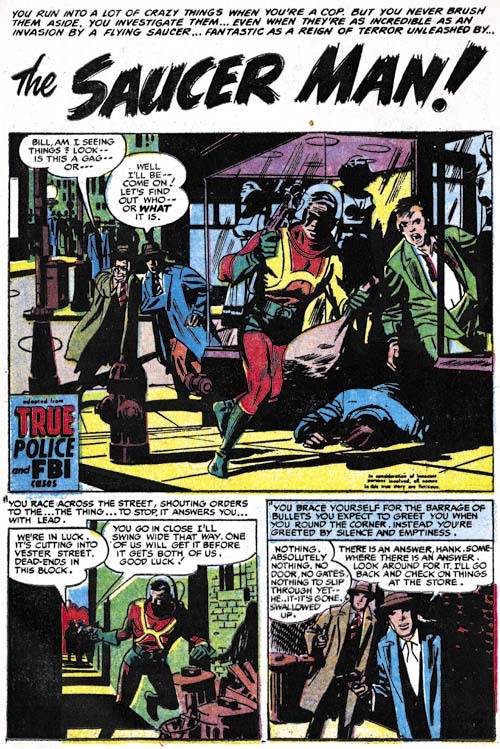 Note how once again the foreground/background relation between the cop and the muggers keeps alternating with the exception of the final panel. Also how the viewing distance goes from a more distant one, to two close-ups than moves back again. Meskin handles the action so well that I am sure most readers did not notice a logical inconsistency. 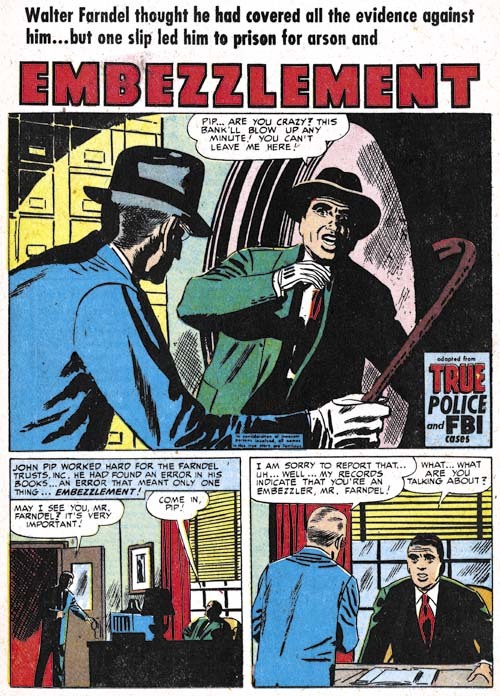 After showing the cop’s hat flying off his head in panel five, how did it manage to return to being firmly attached in the last two panels? 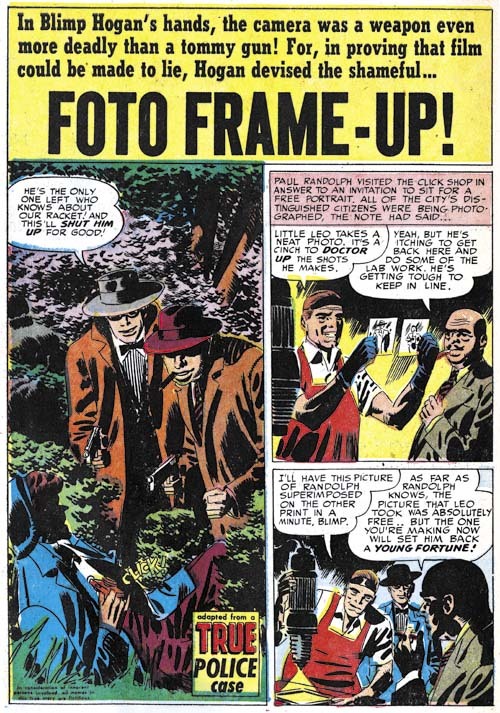 The lose of the hat in panel five is required to show the strength of the impact of the youth’s fist but is a required part of the cop’s “costume” allowing him to be easily identified in the group shots in panels six and seven. What is required for the clear graphical presentation of the story sometimes outweighs the needs of logic. I cannot resist providing another example of Meskin’s graphical story telling talent. Meskin draws in a very stylized manner that perhaps causes many of today’s comic book fans to overlook his other skills. But other artists did notice and were influenced by Meskin. 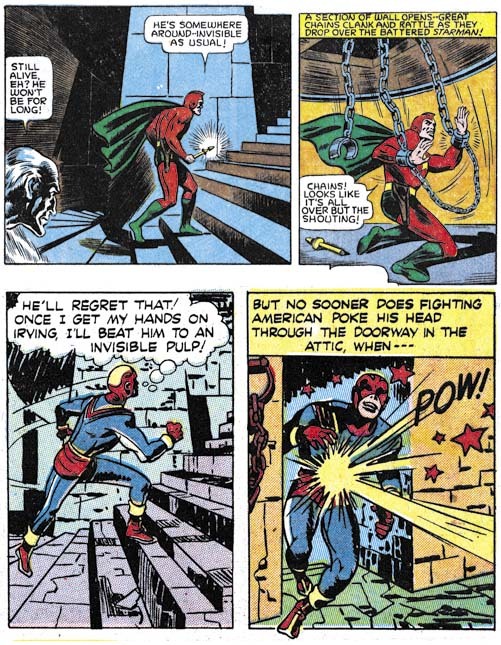 Steve Ditko is probably the most famous of those paid close attention to Mort Meskin. There seemed to have been a move of some sorts in Simon and Kirby productions of 1953 to modify the splash from its tradition roll as the equivalent of a movie trailer. Instead the splash would actually become part of the story. This only lasted about a year in Simon and Kirby comics but this device would turn up from time to time afterwards even in comics not produced by S&K. Was this an artist’s choice or something dictated by the writer? Unfortunately we have no scripts for Prize comics from this period and I do not care to guess at the answer. Still Meskin makes effective use of the device. The splash panel is certainly a classic but the page is made even better by the subsequent panels. What a exciting start of a story! Note the tilted view in the final two panels. I am not sure when Meskin started to regularly use this device but it became an important element in his story telling technique in his later years. 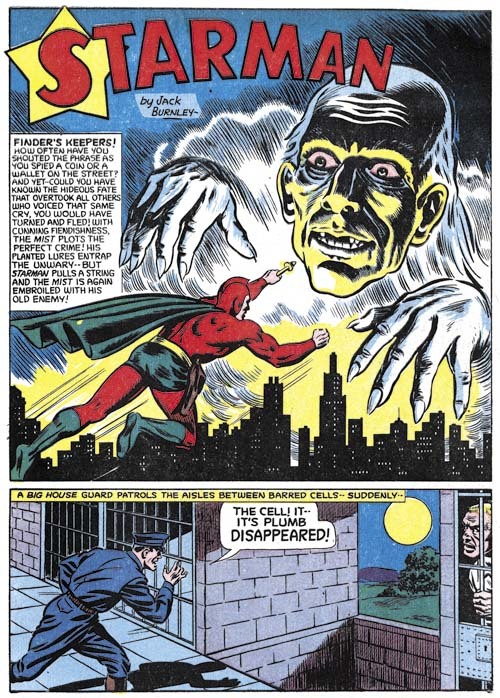 As mentioned above, after the war Mort Meskin did not have many occasions to draw superhero stories. Features like “The Saucer Man” provide some hints about what such superhero stories might have looked like. Although from late in his career, in this story Mort has reverted to the darker inking style that predominated his earlier work. As a rule an artist has an advantage when inking his own pencils. 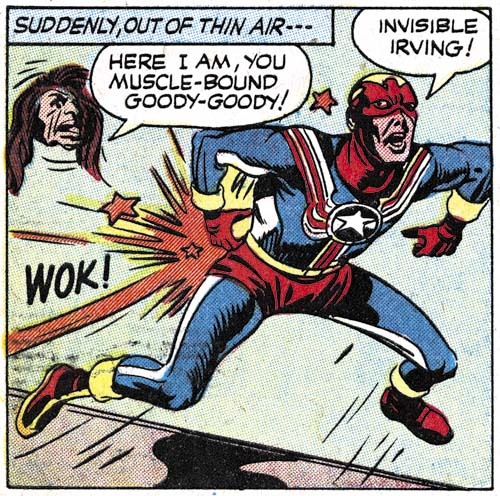 Still examples of Meskin inking Jack Kirby (Kirby Inkers, Mort Meskin ) show that Mort was a talented inker. Meskin generally inked his own work in the 50’s but there were occasional exceptions. In most cases where the inking was not done by Meskin it was George Roussos who did it. Frankly I am not a fan of Roussos’s inking. I feel it is a little too sloppy. However George’s use of full blacks were often quite nice as in the splash for “Embezzlement”. I admit that I have little time for checking out what is the latest on the Internet. Therefore my blog is not the place to go to find the latest news. But my attention was recently pointed to a blog post that I thought deserved comment here. 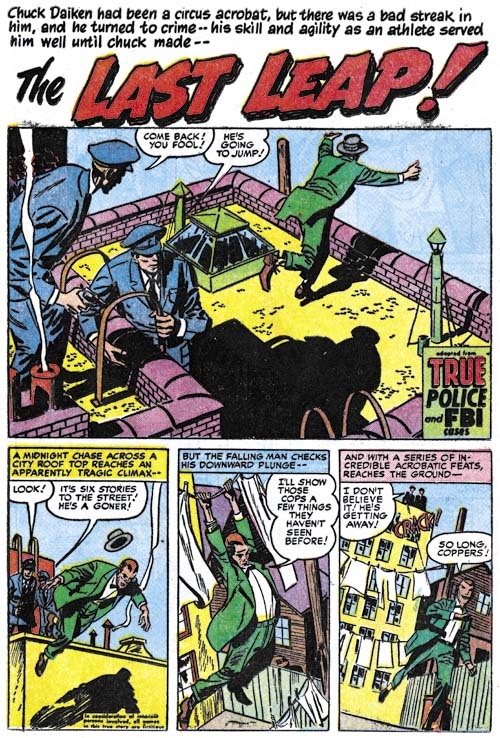 The post in question is DC VS VICTOR FOX: The Testimony of Will Eisner in Ken Quattro’s blog, The Comics Detective. Quattro has provided, for the first time every, the actual testimony that Will Eisner gave in court in the case between DC and Fox Comics. For years Will Eisner has said that he refused submit to Victor Fox’s pressure to say in court that he (Eisner) created Wonderman. Instead, according to Eisner, he testified that Wonderman was based on instructions from Fox. It was a great story of young man standing up for his integrity at the cost of his future business with Victor Fox. Unfortunately the actual trial transcripts shows it is not true. I am sure we will be hearing a lot about how Will Eisner lied. While the transcripts show he certainly plagiarized himself (that is lied) I do not believe Eisner’s telling of the story years later was a lie. Despite all that has been learned about memory in recent years people still think of memory as like some sort of tape machine. The tape might degrade with time but is otherwise accurate. Therefore if someone tells something about the past that is not true, he must be lying. In reality it turns out that it is surprisingly easy to develop false memories. Even the memories that seem to be accurate are often more correctly said to be based on our previous telling of the story rather than the events themselves. I doubt that Eisner would have repeated his story so often if he had actually lying. Will probably believed it and would have been quite surprised had he been presented with the trial transcripts. This is the first time I have seen Ken Quattro’s blog. Quattro started it in February but like I said I am not good with keeping up with the Internet. A quick look at earlier posts on the blog indicate it is well worth following. I know I will. 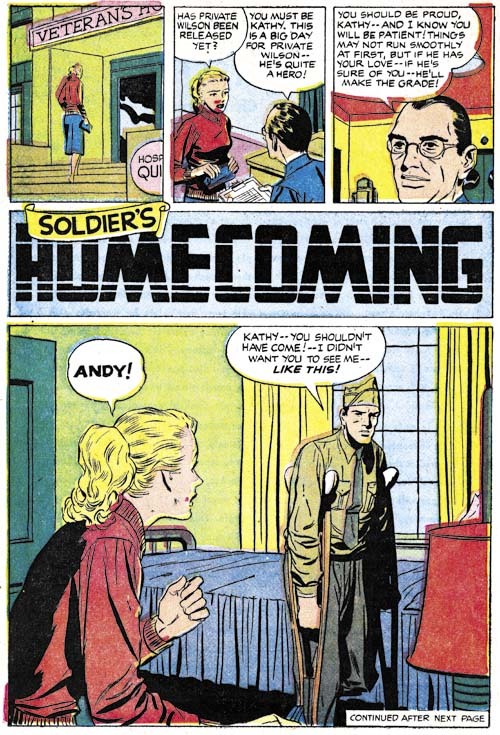 We now come to the end of the all Kirby Price romance comics and transition into a new and significantly different period of Prize Comics. 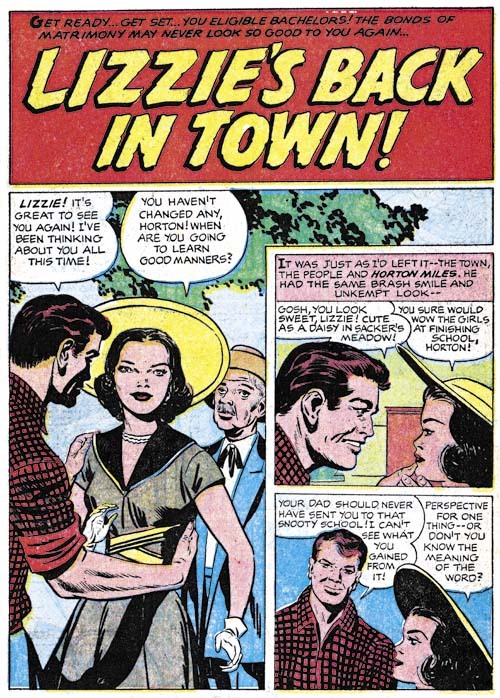 Young Brides #30 (November 1956) and Young Romance #85 (December 1956) qualify as all-Kirby comics but only half of Young Love #73 (December 1956) was drawn by Kirby with the rest of the art done by Bill Draut. Unfortunately the comic book crash had finally caught up to Prize Comics. 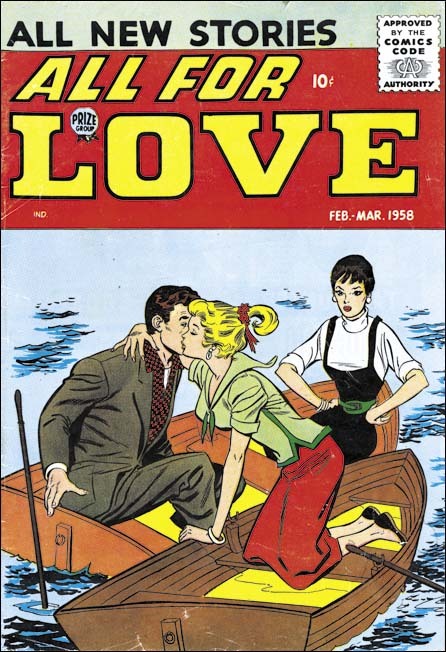 Young Love #73 and Young Brides #30 would be the final issues of those two titles although Young Love would be resurrected in 1960. At the point of cancellation Prize Comics would only be publishing three titles; Young Romance, Justice Traps the Guilty and Prize Comics Western. Since all were bi-monthlies this was a rather small line-up even for such a small company. 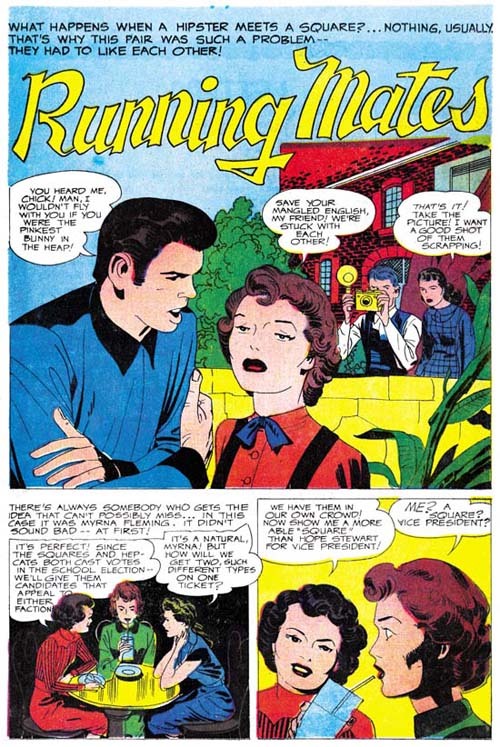 Starting with issue #86, Young Romance was a very changed title. The annual postal statements still listed Joe Simon and Jack Kirby as the editors but whatever working arrangement the two had it clearly was not the same as before. Kirby had started doing freelance work for DC and Atlas while Simon was doing some editorial work for Harvey Comics. 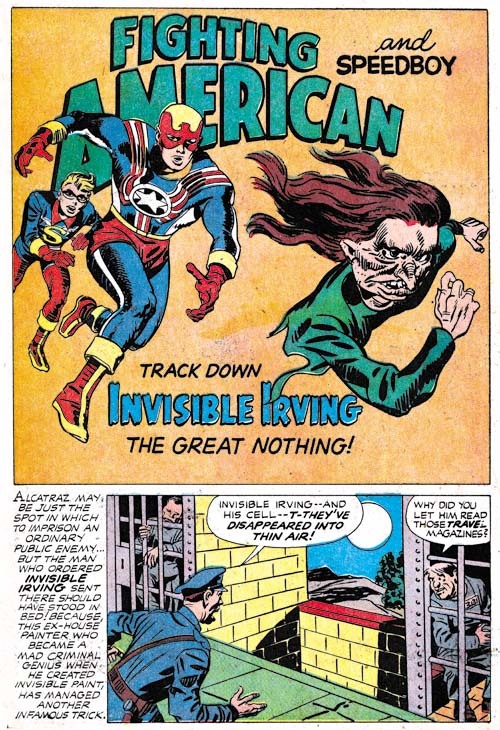 Most, but not all, issues would include art drawn by Jack Kirby. Previously cover art was typically done by Kirby alone but now most covers would be done by other artists. The biggest change that came over the title was the largely complete absence of the earlier S&K Studio artists. 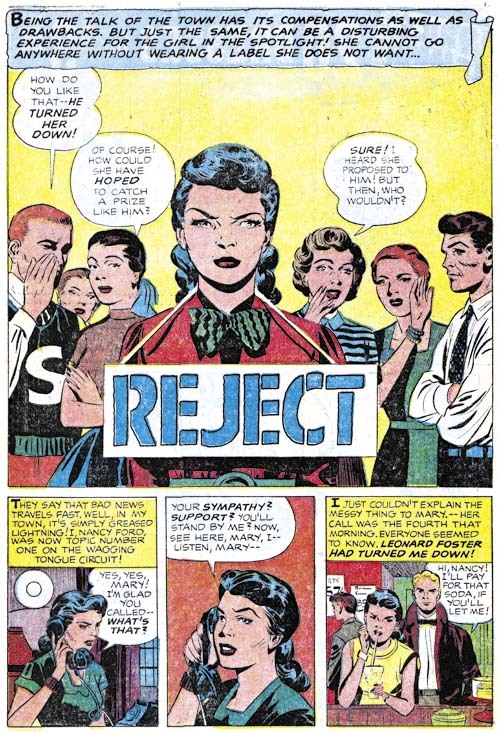 Artists who previously played prominent rolls in the title such as Bill Draut, Mort Meskin, John Prentice and Bob McCarty would never again appear in Young Romance. The fact that some of these artists would show up in Prize romance titles not edited by Simon and Kirby suggests that there may have been some hard feelings between the artists and their former employers. The change in Prize Comics was not a complete retreat but rather a reorganization. In April 1957 Prize came out with a new romance title, All For Love. It may seem strange to cancel two romance titles only to start up a new one. The answer is suggested by the Postal Statements which list Joe Genalo as the editor for All For Love. Prize not only wanted a new title, they particularly did not want Simon and Kirby to produce it. As I mentioned earlier, YR #85 was one of the issues that was drawn entirely by Jack Kirby. While the story art was often first rate, the splashes frequently left something to be desired. At least compared to the work Kirby had done in earlier years. The splash for “Lizzie’s Back In Town” is a good example of this. There is nothing wrong with the splash and granted it was probably a challenge to instill interest into some standing figures, but it was just this sort of romance splash that earlier Kirby was so good at. I suspect Kirby was just trying to do too much romance art in too little time. Some interesting splashes will be found in the future issues when Jack had returned to a more measured output of romance stories. There are exceptions to lackluster splashes. I certainly like the one for “Reject”. This is not because of the subject matter because once again all there is are some standing figures. Nor is it the how well the art was handled; I suspect the original pencils were much better than what was left after the inker got finished with it. I think what appeals to me is the characterizations of the players; the stern central figure and the gossipers in the background. I also like the way the title of the story is placed on a placard worn by the lady. 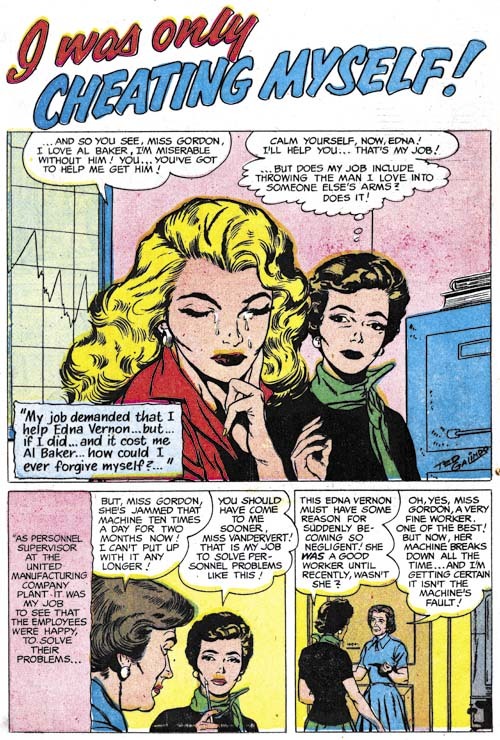 There seems to have been one inker used for all the works penciled by Kirby during this period and a good portion of the art from the all-Kirby romance issues. In the past I had considered it likely that the inker was Marvin Stein. I have heard others advance Bill Draut and Joe Simon as candidates. During the review for this chapter I have come to the conclusion that I am just not sure who he was. In some places it looks like Bill Draut, other Marvin Stein or even Joe Simon. But I also feel it is quite possible that it was someone else entirely. One interesting feature of the inking of the splash for “The Unhappy Housewife” is the presence of picket fence crosshatching (Inking Glossary). This technique was once a staple of the inking of Kirby pencils during much of the Simon and Kirby collaboration. Part of what I refer to as the Studio style inking. Picket fence crosshatching appears on some of the covers from this period but is largely absent in the stories. The inking of eyebrows during this period were often done in a simplified but exaggerated manner. The women in panel 5 of the page shown above is a good example. There is some resemblance between these eyebrows and those used by Bill Draut which is the main reason to suggest Draut was the inker for these Kirby pencils. Unfortunately I cannot find any other evidence to support crediting Draut as Kirby’s inker during this period. But I will return to this subject below. 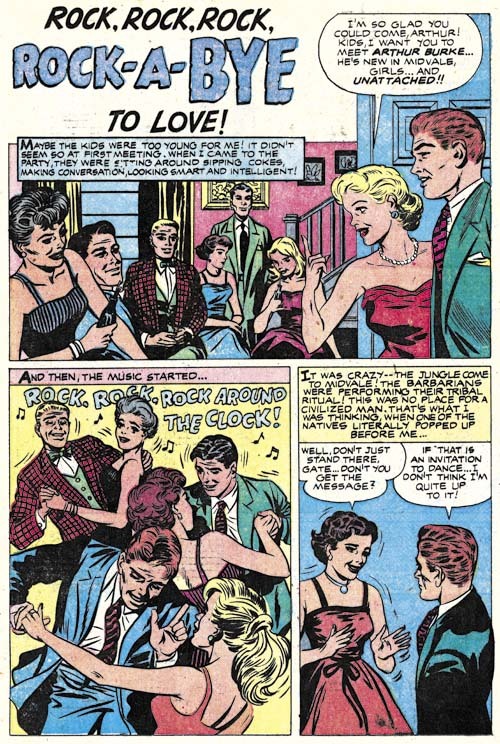 Note the inking of the man’s face in the last panel from page 4 of “Rock n’ Roll Sweetheart”. The black shadow down one side of the face is what I refer to as negative highlights. 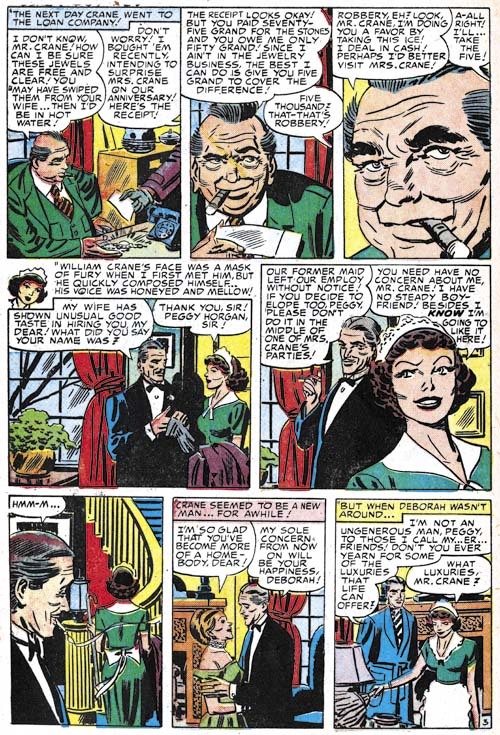 I have never seen Bill Draut use negative highlights but Marvin Stein did and his looked very much like this example. Because the inking evidence does not consistantly suggest one inker, I have decided to no longer attribute the inking to Marvin Stein and for now leave it as an open question. 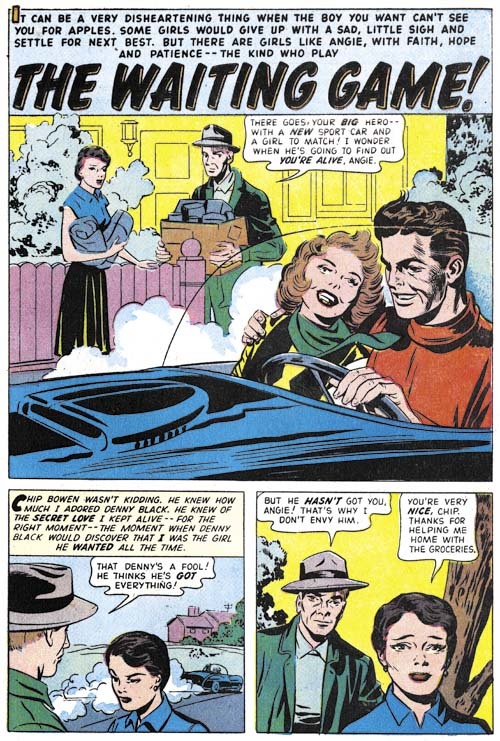 Bill Draut provided two of the four stories from the final issue of Young Love. The style is similar to that he was using just prior to the start of the all-Kirby run. However even that was somewhat different from his earlier work. This is most notably seen in the clothing folds which earlier had been somewhat splotchy but now where cleaner and more streamlined. 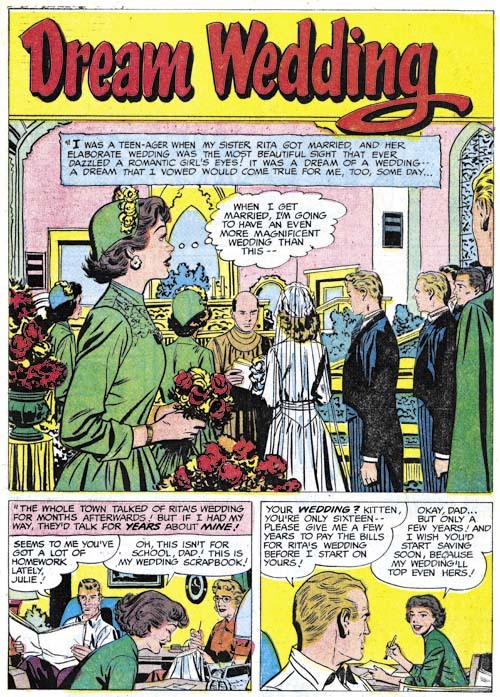 The first issue (YR #87) of Young Romance after the cancellation of Young Love and Young Brides had only a single Kirby story. Oddly the other three stories were all done by the same artist. He is not a bad artist, but I do not believe I have seen him in a Simon and Kirby production before. It is a puzzle why he suddenly achieved such dominance in this romance title. As mentioned above, the new Prize romance title All For Love, was not produced by Simon and Kirby. 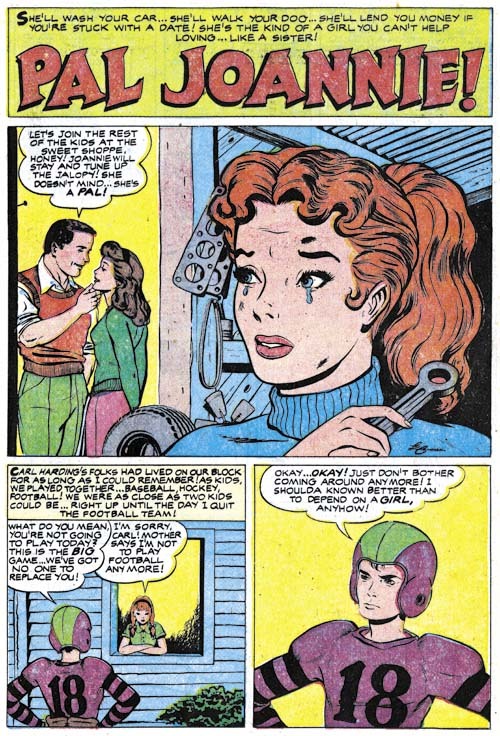 One of the things I will be looking for in future chapters of the Art of Romance was whether the same artists would appear in Young Romance and the Prize titles that were not produced by Simon and Kirby. One artist that shows up in the first issue is Bill Draut. Not only does Draut provide a story but he did the cover art as well. Here Bill is working in the same style we saw Young Romance #86 (February 1957). Bill had also been appearing in some of the Harvey romance titles at this time which I believe were edited by Joe Simon. But it is unclear whether these were new stories or reprints of older material. 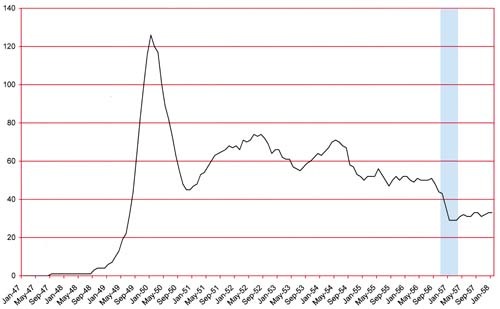 In any case work by Draut for Harvey would end at this same time. Draut would not work with Joe Simon on comics until 1966. Bill did work on Sick but right now I am not sure when that was. All For Love #1 (April 1957) “Hollow Triumph” page 3, art by Mort Meskin? There are two stories in All For Love #1 that I am somewhat uncertain about. I some ways “Hollow Triumph” reminds me of the work of Mort Meskin. The way the eyebrows are inked might suggest Bill Draut but the story lacks any of Draut’s mannerisms of graphically telling the story, in particular the body language depicted and how the use of view points. Meskin is a better fit in just these graphic qualities. However if this was drawn by Mort I am certain it was not inked by him. Some of the inking reminds me of the unidentified inker for Kirby that I discussed above. 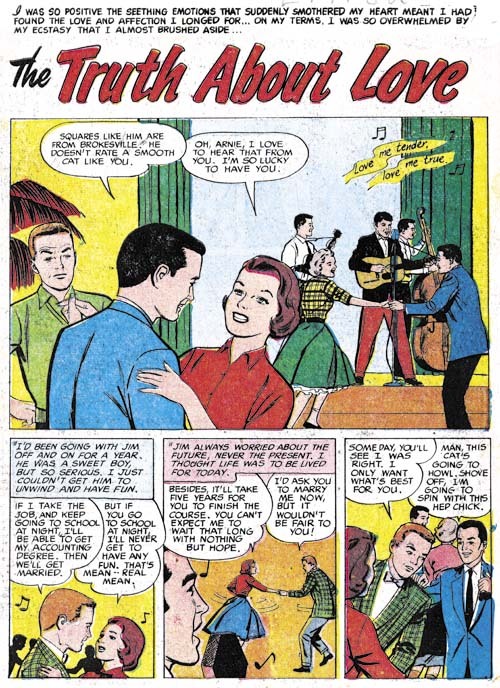 All For Love #1 (April 1957) “My Wishful Heart”, art by Bill Draut? “My Wishful Heart” is the other story that I questionably attribute to Mort Meskin. Although not identical to “Hollow Triumph” it is close enough to suggest it was done by the same artist. We are now coming into the final period covered by the Art of Romance. It was always my intention to take this serial post up to 1960. However I am really uncertain how many chapters remain. Frankly overall I find the Prize romance titles from this point on the least interesting of the series. If not for the presence of Jack Kirby I might be tempted to cover it in some future serial post. But there is some really great Kirby art, much of it inked by Jack himself. Plus some other interesting artists appeared from time to time.